View! View! View! Luxurious 5 bedroom estate located in the prestigious gated community with 270 degree view of the amazing city lights and lake view. There are 5 bedrooms & 5 bathrooms (3 suites) with views in all of the bedrooms! You are welcomed when entering through the grand foyer entrance with beautiful double door, chandelier and marble floor. Elegant living room features fireplace & wood shutters. Individual formal dining room overlooking the beautiful pool & city lights view. Large family room with wet bar, marble floor & panoramic city lights view. Large kitchen with granite counter, Kitchen Island, breakfast nook, built-in appliances with 3 ovens, trash compactor and dishwasher. Spacious upstairs master suite with separate sitting area & balcony to enjoy the breathtaking views. Large walk-in closet, jetted tub, separate shower & spacious counter space. Tranquil landscaped backyard with panoramic view, sparkling swimming pool and spa perfect for entertaining. 3 car garage, 2 zoned central air condition and heating system. 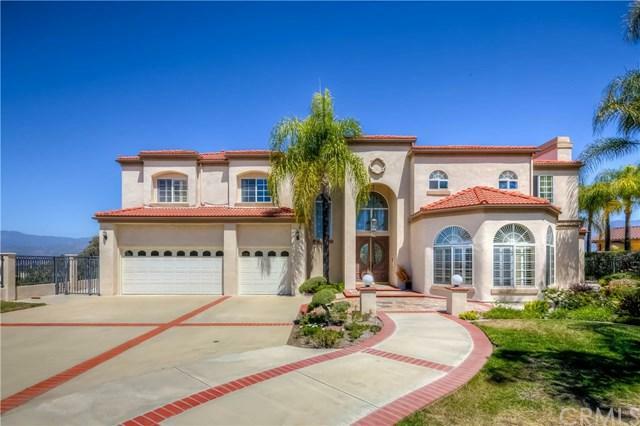 Easy access to Raging waters, FWY 57, Via Verde Country club, shopping centers & restaurants. ***If you need to sell a rental in order to buy this house, owner may be willing to consider buying it!